Dealer admits to cheating at baccarat, taking at least one Maryland casino for over $1 million. For many businesses, hiring new employees can be a tough job. Not only does the boss have to evaluate whether an individual is qualified and has enough experience to handle the position, they also have to determine whether they can trust the person. 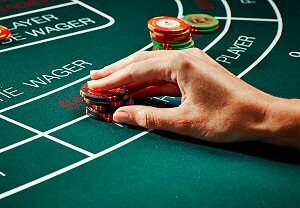 Casinos are particularly hard on new applicants, especially those who will be handling the establishment’s high finances. That didn’t seem to be an issue when Ming Zhang was hired to deal baccarat at the new MGM National Harbor Casino that opened along Maryland’s coast in December 2016. He had the skills, the background, a state-issued license, and the personability to get the job done. Everything seemed in place, right up until he was arrested and charged with conspiratorial fraud. Mr. Zhang has submitted a plea of guilty before US District Judge Paul Grimm. The casino dealer admits to conspiring with others to take the Maryland casino for more than $1 million in September of 2017. For now, though, Zhang is the only individual who’s facing charges in the crime. According to Assistant US Attorney Erin Pulice, the scheme was simple. As the game’s dealer, Zhang exposed the deck of cards to a group of accomplices. Tho took a photograph of the order, then proceeded to place large wagers on the predictable outcomes of each hand. Pulice said that knowing the order of cards gave the “conspirators…near perfect accuracy”. All in all, they were able to take the casino for $1,046,560. The casino involved in the incident was not named in the court filings, nor was it mentioned during Tuesday’s hearing at the US District Court in Greenbelt, MD. However, MGM National Harbor spokesman, Malik Husser, had no qualms identifying the company as Mr. Zhang’s former employer. A spokeswoman for the Maryland Lottery and Gaming Control Agency also notes that regulators are in the process of revoking the former dealer’s license. Court papers reveal that more than one casino was the target of Zhang and his co-conspirators. Apparently, the defendant was present for another incident, where an alleged co-conspirator used the same scheme to cheat at a different Maryland casino somewhere between July and September 2017. The filings indicate that Zhang accepted a $1,000 payment from this person at a nearby hotel. Investigators say he then contacted another co-conspirator requesting additional compensation. That person agreed to meet Zhang at a later date. But that meeting never took place as authorities caught up to him the next day. Reports suggest that the defendant initially denied cheating at baccarat, or any knowledge of the scheme, when first questioned by police. With evidence against him mounting, however, Mr. Zhang changed his tune. He’ now admits to helping cheat the casino out of more than $1 million. Ming Zhang will appear again before Judge Grimm for sentencing on January 31, 2019, where he faces up to 5 years in prison for conspiring to transport stolen funds.